7.19 points at 16 votes (rank 303). 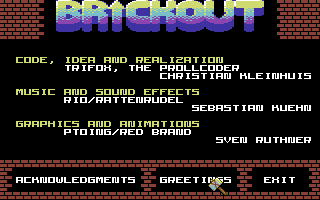 The goal of the game is to clear the game area of all bricks. Stones are removed by placing the cursor (the hammer which follows the movement of the joystick) on a row of stones and pressing fire. The row can be vertical or horizontal (not diagonal) and must at least have two stones of the same colour. 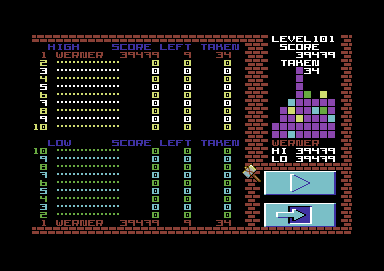 The more bricks of the same colour are removed at once the higher the score will be for that move. When all stones in the level are removed, the level is solved. Furthermore there is the possibility to topple the game area around the horizontal axis ("flip" - i.e. all stones lying on the top will lie underneath the others after this action and vice versa), or to push the leftmost row out of the screen and in again on the right side "shift" to improve the positions of the stones. The points are also interesting. The more stones you remove from the game area in the last move, the higher your bonus points get (see section points). Masters of this game will try to remove 20 or more stones in the last move. In the higher levels stones start to slide, i.e. if a row has been fully cleared and by this two rows of stones can close the gap, the upper stones will slide to the side (if there is space) and fall to the row lying next to them. 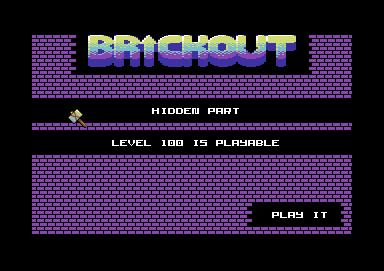 If you play in the difficulty level "Hard", a fifth brick colour appears on the game area, which makes it even harder to clear the level. There are 99 levels in the game which can be chosen randomly to start from. There's also a hidden level 100 as well as the possibility to play all 99 levels in a shuffled order within each difficulty stage. 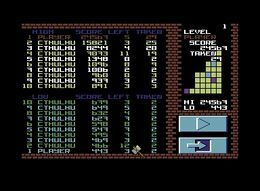 Each level has an own highscore list with each the 10 best and 10 worst entries, which are also saved on disk. The game has been programmed entirely in assembly language. The sound effects match the movements of the bricks very well. The game can be controlled by mouse or joystick. Those input devices are also used for entering the players' data. High- and lowscores are saved onto a separate disk. The name of the last player from a previous session is automatically restored. If you make it to clear all bricks in one level you receive a Bronze, Silver or Gold Cup according to the difficulty level. After the game, the number of the stones removed at the last move is taken cubed (number of stones x number of stones x number of stones) and added to the score. Example: 2 = 8 points, 3 = 27 points, 4 = 64 points, 5 = 125 points, . . . , 10 = 1000 points. Also the score is doubled when the whole level is cleared. Tip to make more points: Als letzten Zug so viele Steinchen wie möglich abräumen, die letzte Anzahl weggenommener Steinchen geht bei der 95% Version als kubische Punktzahl ein, nimmt man z.B. 30 Steine am Ende weg, erhält man 27.000 Punkte. Try to clear as many bricks as possible with the last move; the last number of stones taken away goes in the 95% version adds by the power of 3! E. g.: If one takes away 30 bricks at the end of the game it gains 27.000 points! Besides the standard levels 0 through 99 there's an additional level 100. There's nothing special to it but being yet another HARD-level. Sledgie: "The game is highly addictive and makes a lot of fun. Graphics and sound effects match the gameplay very well." Robotron2084: "Exemplary puzzle hit with great catchy song, which you can and really need to stick to for a loooong time. Hats off for this great work, boys! 9 out of 10 points." Blubarju: "A really good and motivating logical game with many features. Which other game has next to a high-score table also a low-score table. 8 points!" 001 Cthulhu - 24567 - Image Werner - 5028 - Image . Werner - 418 - Image Cthulhu - 443 - Image . 002 . . . . .
101 Werner - 39479 - Image Robotron 2084 - 36150 - Image . . . .
Prollcoder The game is sold exclusively by Prollcoder.com - current versions can be found there first. This page was last modified on 12 January 2015, at 21:00.